Come Fly With Me: The Last Plane Standing? Ever traveled across the country by plane? Remember how long the entire flight took? Four to five hours, right? What if you could travel from Los Angeles to New York in less than thirty minutes with a superior level of comfort than available today? Well, believe it or not, such advanced propulsion technology already exists and it has the power to deliver people, cargo and unfortunately weapons, anywhere on earth in less than one hour. This type of aircraft has been in use since the early 1990’s and was developed by Lockheed Martin’s Advanced Development Corporation (Skunk Works) under a program called Aurora, and has never been acknowledged by the United States Air Force (USAF) or the US government in general. If you’re alive today and reading this post, don’t expect to ever fly by this method anywhere for any reason in your lifetime, it’s that much of a classified unacknowledged special access program (USAP) whose development budget has very likely exceeded $100 billion by padding other defense acquisition programs. USAP programs have absolutely no congressional oversight, meaning they can spend as much as they desire without concern. spaceplane, that can cruise at speeds in excess of Mach 15 (11,000+ mph) at 200,000 feet altitude. The Aurora might be considered the first single-stage-to-orbit vehicle, something the old Space Shuttle design started out as, but was reconfigured and cheapened due to lack of adequate funding. Sound familiar? But wait, there’s much more. This incredible vehicle most likely incorporates a combined cycle, pulsed detonation wave turbojet, turbo-ramjet, scamjet (Supersonic Combustion Ram Jet) and rocket using liquid methane fuel and oxidizer within one system, a true masterpiece of aerospace propulsion engineering. Built of composite materials, this crew of three vehicle might also be able to deliver micro satellites into low-earth-orbit (LEO). According to eyewitnesses who have seen the Aurora in flight, the engine’s sound is extremely loud, sounding like the sky literally being torn apart while occasionally leaving peculiar donuts-on-a-rope contrails behind it. It’s predecessor, the SR-71 was developed in the early sixties through the engineering genius of Kelly Johnson, the former head of Lockheed. 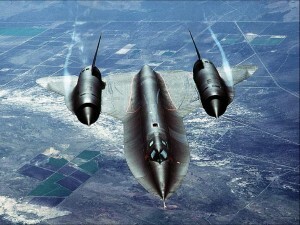 While it’s official top speed is recorded as Mach 3.2, or 2,193 mph at 80,000 feet, that is primarily disinformation. From speaking with several retired SR-71 pilots “off-the record”, the SR-71 flew hypersonic on a regular basis and could easily reach altitudes of 100,000 feet. During the cold war, the Blackbird flew with impunity over the the former USSR, China and Vietnam from the mid-1960’s through the late 1980’s, as there was nothing in existence back then that could touch it. Even today, most anti-aircraft weapons, especially missiles, are not hypersonic (but they’re currently under development and very costly). The old USAF ABM (Anti-Ballistic Missile) Sprint and Spartan systems would have been hypersonic, had they ever been deployed. Our SALT treaties prevented that system from ever seeing the light of day. was very limited in its payload and range and therefore didn’t see long service with the USAF, but nevertheless stills holds some impressive records for altitude and speed of manned bombers in sustained supersonic flight. And remember, this technology is more than six decades old. Given the real performance envelope of the Blackbird, I wonder whether there was ever the thought of eventually incorporating attitude control thrusters on its wingtips, nose and tail in order to maneuver at altitudes above 100,000 feet where dynamic control surfaces are all but useless. Making a turn at Mach 3+ speed requires about 5-6 states (like Nevada, Arizona, Colorado, Idaho & Oregon) of space. Trying to maneuver at such velocities poses many inertial problems as just witnessed by the second failure of the unmanned, USAF’s Hypersonic “Faclon HST” that recently plunged into the ocean due to inertial coupling. Aurora’s shape is quite extraordinary and radically different than almost everything else flying except the Lockheed Martin TR3A & B. 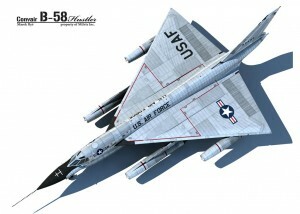 In some ways, it’s derivative of the early 1960’s Mach 3, North American XB-70 Valkyrie bomber, whose legacy ended in a fiery crash during a test flight and the USAF’s realization that ICBMs were the wave of the future as opposed to manned bombers, at least until someones brainchild became the low-level, subsonic, Rockwell B1A & B Lancer were developed as a make-work’s defense program. Now, the USAF wants to upgrade the B1Bs into a full supersonic B1R with Mach 3 capability. In still other ways, you can clearly see the SR-71 lineage in the Aurora’s illustrations depicted here. Majestic, to say the least, isn’t it? Think of a highly tapered, 75 degree triangular shape with twin vertical stabilizers above and below the rear wing trailing edges at each corner. In the center of the blended body triangle is the fuselage which incorporates the combined cycle engine nacelles in the aft, ventral portion of the triangular hull. 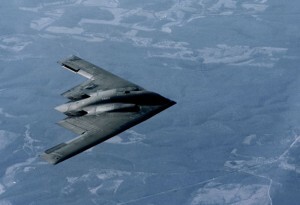 Another interesting application of advanced aerodynamics which might also be incorporated within Aurora comes from Northrop’s B-2 Spirit Stealth Bomber, where the leading and trailing edges of the plane’s fuselage are charged with polarized, high-voltage electrostatic (ES) fields during flight to significantly reduce the drag coefficient and possibly generate a subtle form of wave-riding. With this application, the power required to achieve lift, vector thrusting and maintaining stable hypersonic flight would be dramatically reduced and might even create a powerful laminar flow that helps prevent air compression that leads to a sonic shock wave and boom. further reducing the B-2/Aurora radar cross-section. In fact, the patents filed regarding this specific ES power usage openly discuss this specific function. although few possess the technical knowledge to comprehend it. And just think, these systems were all developed in the 1980’s, some thirty years ago! I wonder as to whether the high amplitude ES fields were reverse engineered from recovered, crashed UFOs? Interesting possibility? 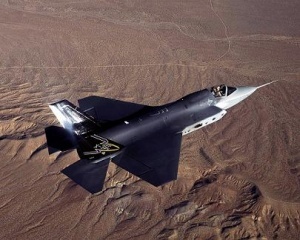 Certainly the most tantalizing technology that could be employed in such a “black” aircraft is an electro-chromic skin. This is where the entire fuselage, wings and tail of an aircraft are covered with sophisticated sensors that detect and read the surrounding visual environment and mimic it. Therefore, if you were looking up at an electro-chromic aircraft, its ventral section, or bottom, would look exactly like the sky above the vehicle. Similarly, if you were looking down upon the plane, its dorsal, or top section, would resemble the air and ground beneath it. The end result would make you believe that you’re staring into empty space. Visually, this is very similar to the way the alien creature was depicted in the Predator movies. For all intents and purposes, this is a visual cloaking device, but not for radar evasion. This technology does exist and has been somewhat openly discussed over the last decade or so. This is not science fiction. Whether such has even been applied to a military craft currently in service is another question altogether. 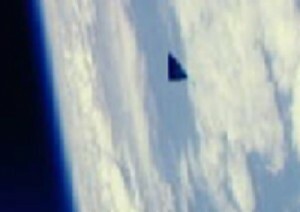 SR-91 Aurora spy plane photographed by Space Shuttle Endeavor during STS-61 in 1986. Space Shuttle flights (STS 61, 5th flight of the Endeavor Shuttle, 1st Hubble Space Telescope service mission) where the astronauts are shooting video through a window only to record the impressive black, triangular, hypersonic spaceplane in a hard left bank. When they go tight on this flying machine, you can clearly see precise details on the fuselage and the vertical stabilizers on each of the trailing edge corners (shown here at right). I wonder how the astronauts felt knowing the the shuttle in which they’re flying is obsolete space junk compared to the SSTO Aurora cruising beneath them? I guess it’s like driving a forty year old Chevy Impala and video taping a new Porsche 918 passing you in the left lane. One doesn’t need to think much to realize that what they’re driving of flying is little more than primitive, old world garbage. The incredibly rapid forward movement of aerospace technology is truly astounding. Will the Aurora program ever be declassified? It’s very unlikely, given that much of it’s technology is still way too sensitive for public dissemination. However, as our military/defense industry is dying a rather slow, agonizing death, who really knows what the end will bring?. When we consider the fact that Lockheed Martin’s F-22 Raptor fighter was supposed to cost “only” $139 million per plane, but eventually ballooned up to approximately $430 million, the orders dropped from the original 687 to about 180. What a surprise? To make matters even worst, the F-22 has been plagued with numerous problems such as its corroding stealth coating that is very difficult and costly to maintain, which completely breaks down if encountering water (so much for fighting in the rain). You don’t need ground-based, anti-aircraft missiles or AAA to shoot down this turkey, just a good strong water hose or squirt gun. For every hour that an F-22 flies, it requires at least thirty (30) hours of maintenance, has a critical failure for every 1.7 hours of flight (Mean Time Between Failure [MTBF] = 1.7 hours), it’s canopy often refuses to open resulting in pilots having to be cut out with plasma torches, and it’s pilot oxygen delivery system failures have caused several crashes and pilot deaths, forcing the entire fleet of around 180 planes to be grounded. Hard to imagine that the engineers who designed the F-22 simply made such critical errors in such an incredibly expensive aircraft? 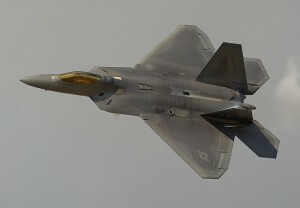 However, when learning the the building of the F-22 was outsourced to 40 different states across the U.S. so almost very congressman’s district would receive jobs, it’s not hard to understand why many of the aircraft’s components did not fit and had to be individually retooled before they could be properly assembled. The F-22 might be the largest financial boondoggle in our military’s history. Every time your taxes increase just remember that they’re being wisely spent on worthless technology that will not perform its job as intended. It just amazing to discover how utterly corrupt and incompetent our government has become, and it doesn’t really matter who’s living in the White House at the time either. Then we have the Lockheed Martin F-35 Joint Strike Fighter (JSF), the 21st century replacement for the subsonic Sea Harrier Jump Jet, the F-15, F-16 & the F-18. The F-35 Lightning was going to be the most lucrative defense contract in military history with over 2,500 aircraft being sold to the Air Force, Navy, Marines and many allied countries. The F-35 was designed as a supersonic Vertical-Short Take Off and Landing (VSTOL) aircraft that could be deployed on standard runways, carriers and into theaters with very short or no runways at all. Seemingly the perfect aircraft for all reasons, except for one of cold, hard cash. Rather than being outgunned by an enemy, the world’s collapsing economy forced the F-35 JSF program to be canceled as neither we, nor anyone else, can afford these new technological wonders anymore. However, the program has been restarted and canceled several times over the last ten years, where they’re trying to fix the numerous glitches with the aircraft. And as if the F-22, the F-35’s final cost inflated from only $78 million per plane to over $138 million. What a deal? And let’s not forget that the Pratt & Whitney F119 engine developed for F-35 turned out to be woefully underpowered for VSTOL functions, causing it to have a critical power failure rate causing the jets to suddenly lose power and crash. Additionally, F-35’s have now starting catching fire while preparing for takeoff which has once again, ground all F-35’s. And like its F-22 cousin, the F-35’s is plagued with identical problems; stealth coating corroded away from oxidation and the presence of moisture, its canopy refused to open and the pilot’s oxygen delivery also repeatedly failed. This is what happens when a major defense contractor outsources their components to 40 states with little attention to precision and coordination. Fatal flaws within the cockpit of the US military’s most expensive fighter jet ever are causing further problems with the Pentagon’s dubious F-35 program. The fleet of the F-35 Joint Strike Fighters was grounded for reasons unrelated; a new report from the Pentagon warns that any pilot that boards the pricey aircraft places himself in danger without even going into combat. In a leaked memo from the Defense Department’s director of the Operational Test and Evaluation Directorate to the Joint Chiefs of Staff, the Pentagon official cautions that even training missions cannot be safely performed on board the aircraft at this time. Pilots claim, “The head rest is too large and will impede aft [rear] visibility and survivability during surface and air engagements,” “Aft visibility will get the pilot gunned [down] every time” in dogfights, remarked another. A routine inspection on a test plane at Edwards Air Force Base turned up cracked engine turbine blades. 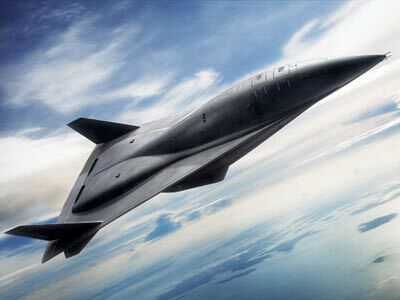 The 25-page report, scheduled to be delivered to Congress this week, provided a disturbing glimpse of the aircraft’s Block 2B software, which is currently not performing at the level of earlier expectations and could significantly delay deployment of the plane. What a piece of junk. Goodbye, good riddance. predecessors. The A-12 Avenger II was to be purchased by not only the US Navy, but by the Marines and Air Force as well, totaling well over 600 aircraft. The A12 Avenger II eventually gained the nickname of “flying Dorito” due to its shape and rapid disappearance. However, the inevitable cost overruns, major electronic system errors and haggling within the Pentagon and DOD killed this most promising machine only after spending billions on its development during the late 1980’s and early 1990’s. Never let it be said that our tax dollars are not being well spent, especially when a hammer or toilet seat in the military can cost many thousands of dollars? Yet, we’re wondering why our country is near bankruptcy? Can’t imagine? Given that the US is far too broke to field new military aircraft, what happens when our aging fleet of F-15s, F-16’s & F-18’s are no longer air worthy due to the fatigue and stress factors of their time? There’s already been incidents where these decades-old aircraft are breaking apart in mid-flight due to fuselage fatigue. As these fighters can pull up to 9 g’s during combat maneuvering, the accumulated stress is enormous. As military pilots are considered expendable assets, their safety is somewhat ignored. However, it’s hard to fathom the fact that the probability of being killed while flying a military aircraft (even in non combat conditions) is one in four, that’s 25%! If commercial aviation had that kind of attrition factor, the airlines would have gone out of business long ago as no one with a brain would ever fly. So when we run out of fighters and bombers, what then? 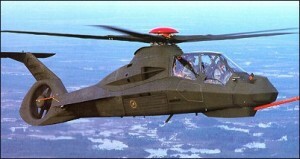 Remember the Boeing/Sikorsky RAH-66 Comanche helicopter being developed for the Army several years ago? It also got the production axe (after spending several billions in development) due to budgetary constraints. But much of its stealth technology somehow ended up in the helicopter used by Seal Team Six that killed Bin Laden several months ago. As they could not afford to deploy something new, maybe they simply applied some of the new systems to older helicopter models? I wonder how much of the crashed stealth helicopter was really salvaged? Some years back there was an interesting concept circulating in our military given the enormous cost of developing and producing ever more advanced aircraft. Military planes would eventually become so insanely expensive that there be only one fighter/bomber in existence. On one day, the Air Force would have it. On the next day, the Navy would get to use it. On the third day, the Marines would have their way with it. On the fourth day that Army could use it (what does the Army need fixed-wing aircraft for?). For the remaining days of the week, the different military branches would simply draw straws to determine who had access to the last military flying machine. It’s sad to admit that we have now reached this point. Maybe some good will eventually come out of all of this. If the world grows so economically depressed that it’s armed forces can no longer afford advanced weapons of war, perhaps war will become obsolete as the world can no longer afford building more efficient weapons for depopulating the earth (do you remember where this particular line of dialogue comes from?). Most people do not even know what really caused the collapse of the former “Evil Empire”. It’s really amazing to discover how well disinformation works on a global scale when it comes down to strategic war planning. What really caused the collapse of the former Soviet Union was their belief that the US military was going to build and deploy President Ronald Reagan’s “Star Wars” or Strategic Defense Initiative (SDI), that would have consisted of a constellation of orbiting directed energy weapon satellites to shoot down enemy missiles in their boost phase. Instead of the Soviet economy building cars, appliances, televisions, stoves, etc., most of the country’s money went towards developing effective countermeasures to SDI that was, in reality, nowhere near mature enough to even think about deploying. Some thirty years later, such directed energy weapon technology is still too crude to effectively deploy on earth at the scale discussed by Reagan, let alone in orbit. Even the current Airborne Laser (ABL) program aboard a heavily modified Boeing 747, which has demonstrated great success thus far during testing and evaluation, has been scraped due to lack of funds. So without firing a single shot and turning the cold war into a hot one, Reagan defeated the old “evil empire” as he put it. Problem is, we’re in the same place today that the Soviet Union was a mere twenty-two years ago, but for different reasons. What if they gave a war and no one came because they could not afford to attend? Sound interesting? 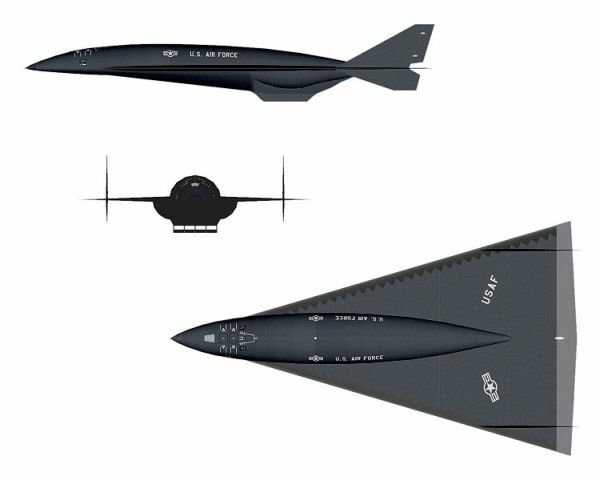 Then of course, there is the developing unmanned combat aerial vehicles (UCAV) that are smaller, cheaper, can perform maneuvers impossible for living drivers and do not put pilots and their families in harm’s way. Wow, a unilaterally deathless war, at least from our end. What really saddens me is the fact that all of this incredible aerospace technology will never come to serve us in a commercial way, in making the transport of people and cargo extremely efficient and timely. Although without war, most of our modern conveniences such as jets, microwave ovens, cordless and cellular telephones phones might never have been invented. However, the incredible strides within the military that have been made over the last sixty years are so extraordinary. that many of them threaten the very power structure of modern society in general and therefore may never see the light of day in terms of making a better way of life. But what if brilliant minds that design, develop and build such astounding weapons were turned loose to improve the human condition at every level? May the day when we finally beat our spears into plow shears be close at hand? Only time and the collapsing world economy will tell, although it’s when one is down on their collective knees that their adversaries are likely initiate warfare. A scary thought for everyone. Perhaps this time more level heads will prevail? What do you think? Posted on February 16, 2012 November 18, 2014 Author Dr. Barry TaffTags Advanced Aerospace Propulsion, B-2 Spirit Bomber, B-58 Hustler, B-70 Valkyrie, Barry Taff, Dr. Barry E. Taff, Electro-chromic aircraft skins, F-22, F-35, Hypersonic spaceplanes, Lockheed Martin's Skunk Works, Lockheed Martin's SR-91 Aurora, SSTO Vechicles, Unacknowleged Special Acess Programs, USAPs2 Comments on Come Fly With Me: The Last Plane Standing? 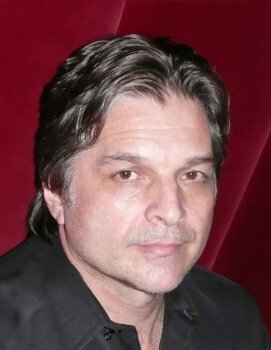 In the early 1970’s I met a young man by the name of Richard Christian Matheson, the son of Richard Matheson, veteran writer for The Twilight Zone (1959-1964), Star Trek, The Night Stalker, Legend of Hell House, Somewhere In Time, etc., who later became a successful writer/producer of both feature films and television. Shortly after meeting each other and becoming friends we discovered that we have the same birthdays; month, day and time, but he is four years younger than I. 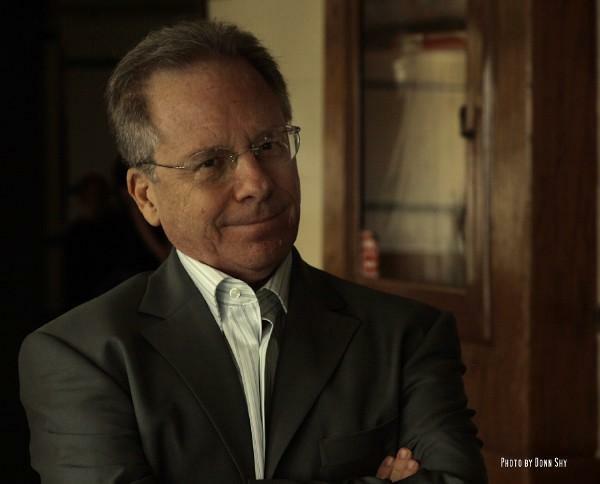 We worked on a few projects together and he accompanied me on several investigations. As his career grew more successful we lost touch with each other for almost thirty years. 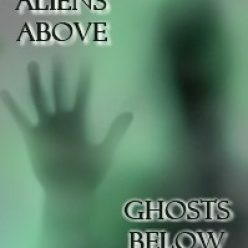 Upon reconnecting again in the middle 2000’s, far more peculiar synchronicities were revealed. He drove a Lexus and I, a Toyota Supra Turbo, whose license plates differ by only one number. When we met for lunch, I saw that he was wearing a very specific watch, a brushed, stainless steel, TAG Heuer Kirium Chronograph, to be specific. I’ve always loved watches and I used to have a stainless steel Rolex Submariner Date for almost thirty years. It was a piece of junk that never kept accurate time (at least on my wrist) and required frequent maintenance (every three years at a cost of around $700). I wised up and sold the non- working, although beautiful, watch in 1997 for more than twice what I paid for it. The only other watch I really wanted after the Rolex was a TAG Heuer Kirium Chronograph, which Richard just happened to be wearing (his parents bought it for him as a birthday gift). I finally was able to purchase (rather expensive at over $2,500) my own brushed, stainless steel TAG Heuer Kirium watch, although mine is the F1 model. There are likely hundreds of thousands of different makes of watches and many different models of each make. What are the odds of us both having the almost identical watch? 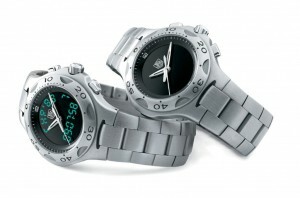 At that time, TAG Heuer offered dozens of different models with numerous variants of each. The chance of this being a coincidence are astronomical! Alright, I’ve spent enough time on the time here, let’s move on to the next level of synchronicities related to Richard and myself. During the course of our lunch I learned that Richard had been married and divorced since we last spoke several decades earlier, although this particular aspect, I fortunately, did not share in common with him. He had a relatively new girlfriend who lived with him, and her name is Diana. All right, wait a minute here. 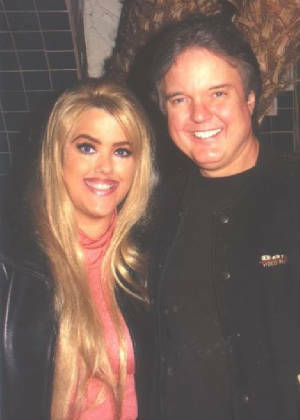 The last girl I almost dated before meeting up with Richard again, was named Diana. What a coincidence? Several years later I had to have several moles removed from body, one above my navel, one directly behind it on my back and one on each side of my body, forming a perfect circle around the center of my thorax all equi-distantly space around the middle of my body, sort of north, south, east, west. About a week later I was speaking with Richard and learned that on the very same day I had my moles removed at a local dermatologist’s office, Richard had similar moles removed from the same locations, but at his dermatologist’s office. Think this is strange? Read on, the best is yet to come. Quite recently, I was speaking with Richard about an incident when I was seventeen and body surfing off a California beach. Suddenly I was pulled under the waves by a powerful rip tide current. I struggled fiercely against it, eventually being overwhelmed by the irresistible force. I shortly ran out of breath and began to drowned. I vividly recall blacking out as my lungs filled with salt water. Everything went dark and I assumed that I was near death. Suddenly, I miraculously found myself standing erect in what was probably just two feet of water. I have no idea how I got there or what happened after I lost consciousness several feet below the ocean’s surface. There didn’t appear to be anyone even close to where I was who could have helped extricate me from my apparent drowning. I never figured out what happened in this situation as there was absolutely no evidence whatsoever regarding the extraordinary rescue that occurred. What pulled me out from the rip tide beneath the waves? Not surprisingly, four years later, Richard, at the age of seventeen, was at the same beach and experienced the same type of apparent drowning and otherworldly rescue. Who saved him and how? Perhaps the real question should be; who saved both of us and why? I couldn’t invent this stuff if I wanted to. Okay, I’ve heard of being joined at the hip, but this is ridiculous. One of the last and most significant synchronistic links between us is something I never even knew about until my mother passed away in the summer of 2009. I was telling Richard about her passing and he asked what her name was. When I told him that my mother’s name was Ruth and her middle name was Ann, there was a definite pause in his voice, as if to contemplate what he just heard. As it turns out, Richard’s mother’s name is also Ruth and her middle name is Ann and her maiden name has the same initial as my mother’s maiden name. Fortunately, Richard’s mother is still very much alive. Whenever Richard and I start talking about these synchronicities, I always comment that as we are in some strange way linked, and that he perhaps came out on the better end of things as he received the height, the hair, the looks and the financial success I’ve never experienced. Yet another striking parallel between us is that Richard and I are literally compelled to pun quite regularly, a condition known as paronomasia. 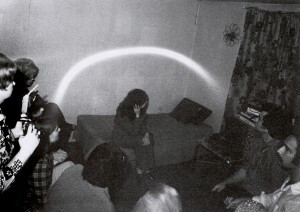 The latest synchronisitic event was when Richard Christian Mastheson’s father, Richard Matheson, died in late June of 2013. Terrible day for a great, strong and wonderful family, and a terrible loss for the world at large, in that one of its best writers ever was forever silenced. But when I received the news of the father’s passing, the date meant something really important to me and I initially didn’t even know why. When I came home, I discovered why the date of Richard’s father’s passing seemed particularly relevant to me. That month and day was the same date that my father was born. Oh my god! This is starting to lose its intrigue and becoming somewhat disturbing. What’s left after all of that, how is one supposed to react? I really don’t know. Better that one of us have the really positive aspects in their life (sans Richard’s fathers death), than neither. One last significant synchronicity related to Richard and I. As I was actually writing this blog, I received an email from Richard having no bearing whatsoever to this topic, but nevertheless, timely in its arrival. One way in which synchronicities are defined is that of an acausal link between people and events. Supposedly, such occurrences are nothing more than coincidences, right? Or are they? In lieu of what I just discussed between Richard and I, what would you call such an extraordinary series of lifelong coincidences? Bottom line, how many coincidences does it take to make a fact? God only knows, and its for us to eventually discover how reality might really work and why. I have a strong feeling synchronicities far more relevant and meaningful that we could even begin to imagine.